Use these helpful tips to determine your own ring size, or that of a loved one. Feel free to call us if you have questions about ring sizes and widths. It is always best to measure your finger size by trying on "dummy rings," you can order an inexpensive sizing set from us (see below), and it will only take a few days to get to you. This will allow you or your loved one to actually try on 4mm-wide plastic rings in half sizes between size 2 and size 14 to find the proper fit. This is the most accurate method of determining ring size--our minimum order requirement does not apply to this item, so order now and your kit will arrive in a few days! In addition, all jewelers and department store jewelry departments will also be able to determine your ring size by letting you try on dummy rings, and most can measure a ring that you already have by using a "ring stick." If the ring is a surprise gift, ask his or her friends or mother for the ring size. Or borrow a ring (make sure it fits the correct finger!) from her jewelry box or his dresser, and take it to a local store (see above). If you find that your ring does not fit, don't worry! You may return the ring to us and we will resize it for a minimal charge. Most jewelry stores will also resize rings--so shop around (by phone) and find a reputable local jeweler who will resize your ring if you are in a hurry! You can also print our Ringsizer Helper page (it requires Adobe Reader) which will allow you to determine an approximate ring size. Be sure to closely follow the printing instructions! Some ring designs are available in multiple widths, such as in wedding bands. To help you visualize various ring widths, use our visualization tool below. Generally speaking, larger hands look best with wider rings, but this is strictly a personal preference, and preferred widths tend to vary depending on prevailing fashion. A ring with a wide band (larger than 6mm) should be sized about 1/2 to 1 size larger than typical dummy rings because the wider band allows less flexibility in the tissue of the finger and is more difficult to pass over the knuckle. A "tapered" ring style may be wide at the top, but the bottom of the ring is more narrow, so it does not need to be sized larger. Finger size varies with ambient temperature and time of day, and for women, with time of month. 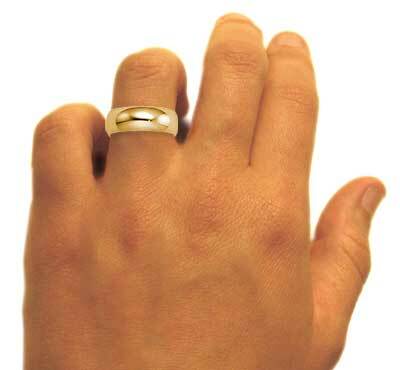 Measure ring size when the finger is the largest�typically at the end of the day and when hands are warm. Don�t assume that finger size is the same for both hands�the fingers on the dominant hand are usually larger by about a half size. The average ring size (ring finger) for women is about size 6-7 and for men, size 10-11. Of course, thumb rings and pinky rings will be vastly different in size! We will sometimes email our customers prior to order processing in order to confirm ring sizes. Please note that the ring size kit will be sent via First Class Mail at our expense, to US addresses only, and that our $40.00 minimum order requirement does not apply to this item. Select the width to see it on the model's hand.